Just released today! A Supernatural novel that reveals a previously unseen adventure for the Winchester brothers, from the hit CW series! Joe Schreiber is the author of several horror novels including Chasing the Dead, which received a starred review in Publisher’s Weekly, Eat the Dark and the fothcoming No Doors, No Windows. His stand-alone Star Wars novel Death Troopers will be published in hardcover in October 2009. When he is not writing, Joe works as an MRI tech. The official Support Supernatural store on CafePress. 100 percent of this site’s profits go to “A Dog’s Life Rescue,” based in Los Angeles, CA. Visit their shop now for tons of unique Supernatural merchandise, and support a worthy cause! Buy this book now from CafePress! 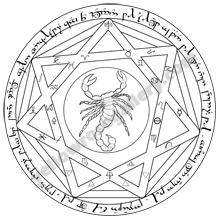 My Devil’s Trap combines the heptagram from the Grand Pentacle with the scorpion of the 5th Pentacle of Mars from the Key of Solomon. See additional products available with Zazzle too. When buying from CafePress, I ask that you please support the designers by purchasing directly from the designer instead of the CafePress marketplace. You can learn more on my blog. Reviews for the Warner Brothers version is that it’s slightly larger than 1″ and has the “new, untarnished” look of the flashback episodes. The description of it is “a metallic alloy” so I don’t know if it will tarnish over time. I’m going to assume that it won’t, since most plated alloys are designed specifically not to tarnish. Both amulets have a ‘jump ring’ to connect it to the cord, whereas Dean’s original amulet does not have the jump ring. Neither amulet appears to have a clasp for the cord; it must be slipped over your head. I’ve heard good and bad reviews for the cords on both, so it seems they come in a variety of lengths. I might recommend getting a new cord with a clasp to keep the amulets from coming off. Do you like Dean’s amulet? Share it with a comment/like on Facebook! We’ve got all the official merchandise here, along with some custom designs made specifically by Supernatural fans. You won’t find a collection like this anywhere else! Here you’ll find all the best price comparisons for the exciting 4th Season of Supernatural. We’ve got all the top sources for buying online, including Amazon, Best Buy, and the CW’s parent company, Warner Brothers for exclusive Supernatural merchandise! Wishcraft by Barbara Sher is an excellent book for determining your goals and planning a path to reach those goals. I read it for the first time 15 years ago and by following the principles outlined in the book, I’ve managed to make significant changes in my life. Since the first time I read the book, I returned to college; ran a small gift shop; changed my career; bought a house; and fell in love. I can’t say Wishcraft made all of that happen, but I believe it was directly responsible for much of it. Feel free to follow my progress on my blog as I go through the exercises once again. It’s going to be an exciting journey! Share this on Facebook! Let your friends know if you like this book.